OK, I'm not quite the tall, willowly blond Tippi Hedren was. The Butterick pattern was published in 1963, and had fake pocket flaps, rather than patch pockets, and the jacket had no cuffs. The film was released in 1963, which means it was probably filmed in 1962. 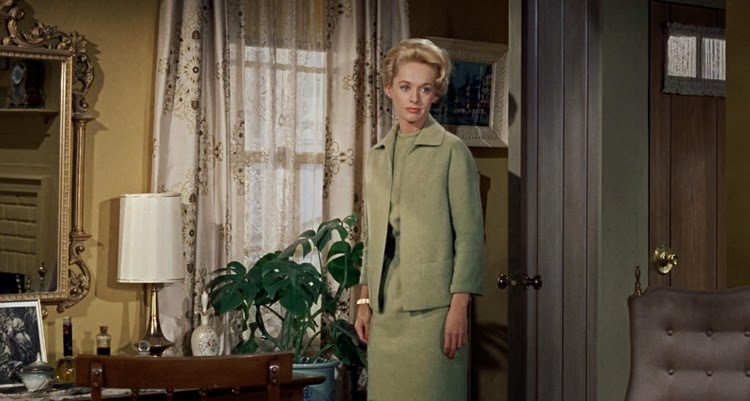 I recently trolled the internet for 1962 patterns and saw that the suits in 1962 did have the patch pockets and collars more like Ms. Hedren's. As you recall, I used McCalls 5972 (the blue dress version) for my dress under the jacket. It is just a basic, sleeveless sheath dress. I lined the bodice with some leftover quilting weight cotton I had in my scraps stash. I did not line the skirt portion. It was interesting that Edith Head's original conception of the costume was a skirt and blouse under the jacket, just like my pattern. Somewhere along the way, she must have decided to do a dress instead. Whoops, I probably needed a little more pressing back there. The Carpenter didn't get a photo of the bottom of my dress - it's straight, with a back vent. Because the jacket is boxy, you need a straight skirt. A full skirt with a boxy jacket is not the most chic look. This suit was a joy to sew, and my favorite thing I have ever made. I have high hopes that it will equally be a joy to wear - I certainly enjoyed wearing it this afternoon. While I usually don't like having self-imposed deadlines, I'm glad I did for this suit because it really is a cooler weather suit. There's nothing more deflating than working on a garment and then putting it away for six months before you can properly wear it. All my posts on this project are here. (I believe it is some sort of rayon/silk blend.) I have until February 12th to wear my new suit to the Hollywood Exhibit at the VMFA and compare it to the original inspiration! Thanks, Joe, for all your kind words! That looks fabulous, great job Kim! You gotta pop the collar! Very niiiice! Really looks sharp. Oh wow. This is beautiful! You did such a great job. It looks wonderful! I'll be happy to go with you to the VMFA and take your photo by the exhibit. What a gorgeous suit! beautifully made and a chic elegant classic, You look absolutely stunning! 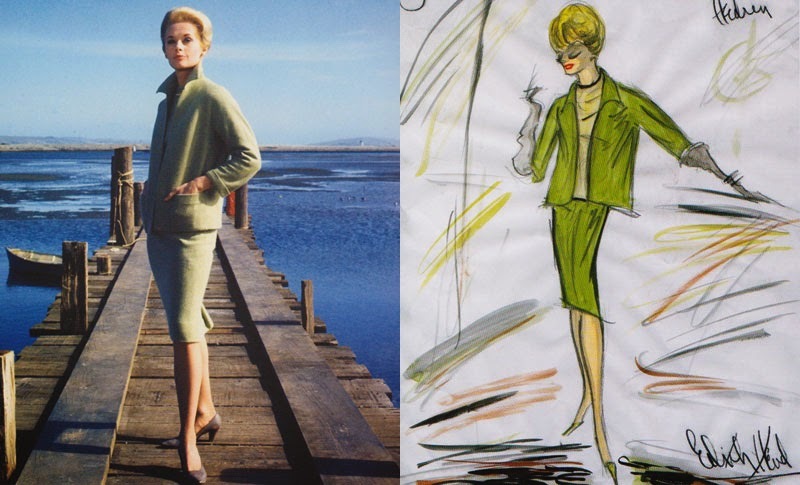 Tippi Hedren Suit - A Major Shortcut!